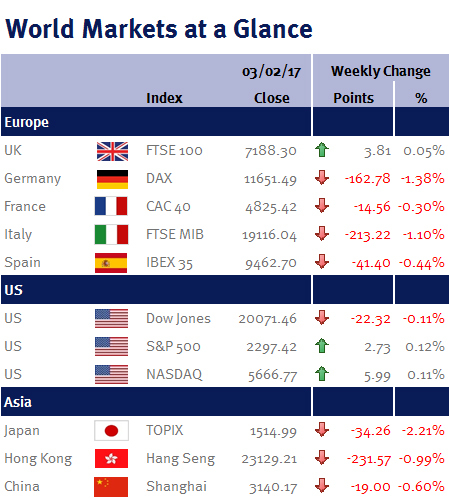 Week ending 3rd February 2017. While the news headlines were dominated by Parliament’s vote on Brexit and Donald Trump’s executive orders and his sacking of the acting US attorney general, Sally Yates, markets were more concerned with economic news. January’s US employment data was a Goldilocks scenario for equities: strong growth in employment; an increase in the participation rate; and no evident cost pressures. Although the report showed that the US economy’s momentum continued into 2017, with employers adding the most workers in 4 months (227,000 jobs in January, 47,000 more than economists expected), the unemployment rate rose to 4.8%, suggesting that more Americans are re-entering the jobs market to look for jobs, while hourly earnings slowed to 2.5%, the weakest increase since last August. This gives the Federal Reserve Bank (Fed) the perfect excuse to wait and see how policies from Donald Trump’s administration will impact the US economy before increasing interest rates any further. Attention was also on US corporate earnings. We are now just over halfway through this quarters reporting season: of the 274 S&P 500 companies that have reported, 204 companies (74.45%) reported earnings above estimates and in aggregate, companies reported earnings 3.3% above expectations (Telecommunications have so far been the main disappointment). In the UK, the Bank of England’s (BoE) Monetary Policy Committee left interest rates unchanged at 0.25% and gave no indication on the direction of its next move. While the BoE increased its growth forecast to 2% for 2017 (up from its earlier forecast of 1.4%) and expects inflation to overshoot its 2% target for the next 3 years (peaking at 2.8% early next year), they warned that there is still slack in the economy and uncertainty over how the UK economy will adapt to Brexit negotiations as business investment has already flat-lined. Although the week ahead is quieter on the economic front (we have China’s foreign exchange reserves on Tuesday (7 February) and its trade balance on Wednesday), in the UK we have the housing white paper – due to be published on Tuesday (7 February). Over recent years house builders have enjoyed super-normal trading and profitability. However, leaks and recent media speculation suggests that going forward growth may be slower.